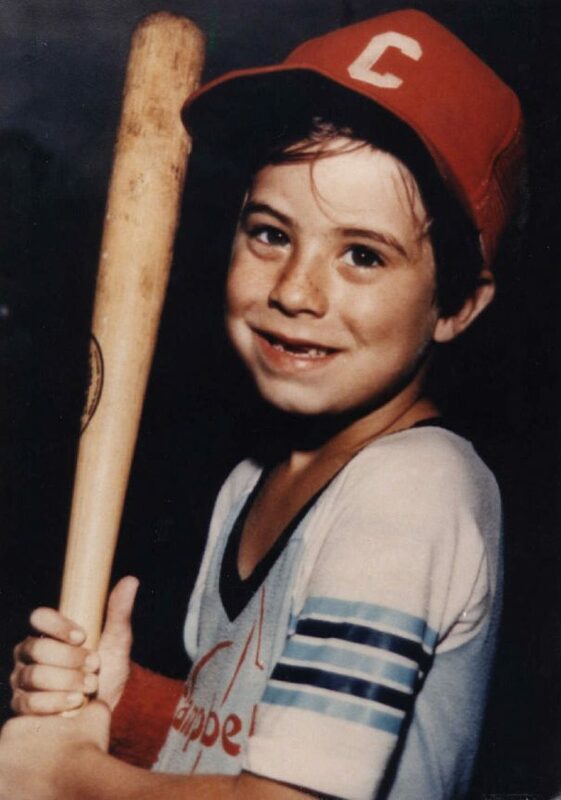 On July 27, 1981, Adam Walsh, 6, played a video game at the Hollywood Sears store while his mother shopped in another department. He disappeared. Two weeks later, his severed head was found 100 miles away. The boy’s grieving parents were instrumental in establishing the Adam Walsh Child Research Center, which helps find missing children throughout the nation, and a Missing Child’s Act, signed into law by President Reagan. 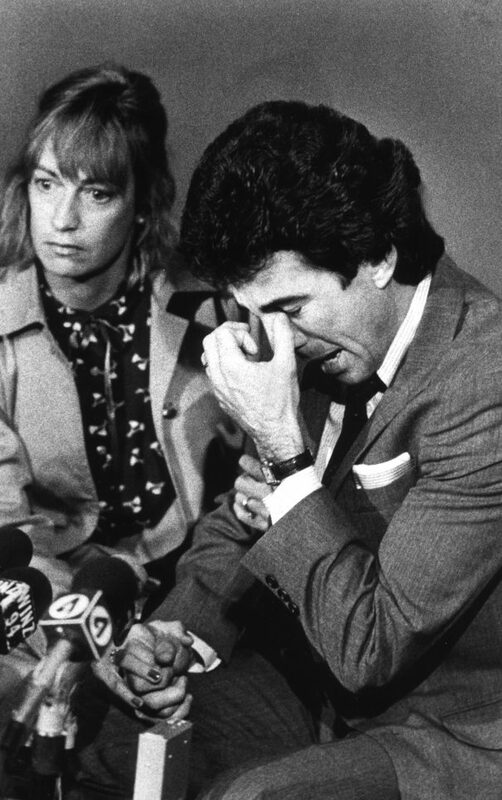 John Walsh hosted America’s Most Wanted, a syndicated television show. In 2008, Hollywood police closed the case, pinning the crime on a drifter who they had zeroed in on for years. Ottis Toole died in prison in 1996, convicted of other crimes. He was never tried for Adam’s death. 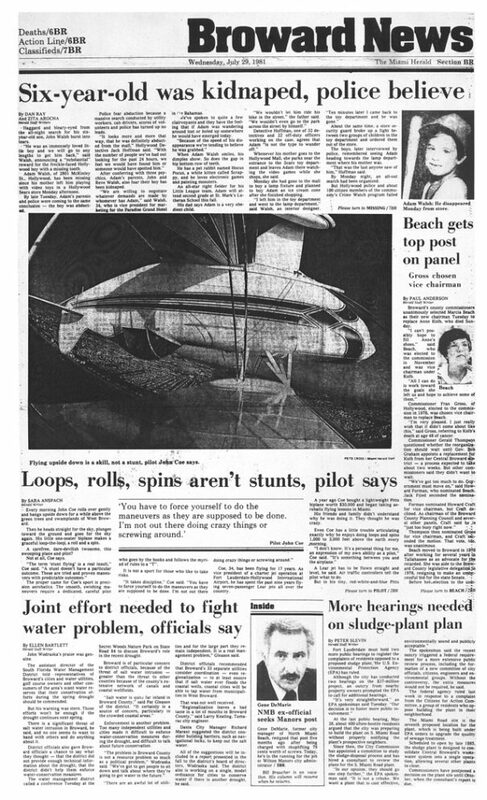 Cover page (page 1 section letter BR) of the BROWARD NEWS section of the BROWARD edition of The Miami Herald issue published in Miami, Florida on Wednesday, July 29, 1981. Features SIX-YEAR-OLD WAS KIDNAPED, POLICE BELIEVE, by DAN RAY and ZITA AROCHA/Herald Staff Writers with associated photograph "Adam Walsh: He disappeared Monday from store." 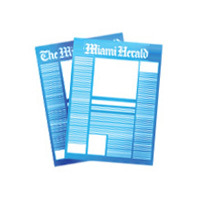 Cover page (page 1 section letter A) of the FINAL edition of The Miami Herald issue published in Miami, Florida, Wednesday, August 12, 1981. Features BITTERNESS REPLACES HOPE FOR PARENTS OF DEAD BOY, by PHIL LONG and JANET FIX/Herald Staff Writers, with associated photographs "Grief-stricken Reve and John Walsh arrive at Fort Lauderdale airport late Tuesday night." 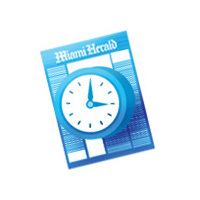 by PAM SMITH O'HARA/Miami Herald Staff; and "Adam Walsh: Long search was in vain." A file photograph of Adam Walsh. 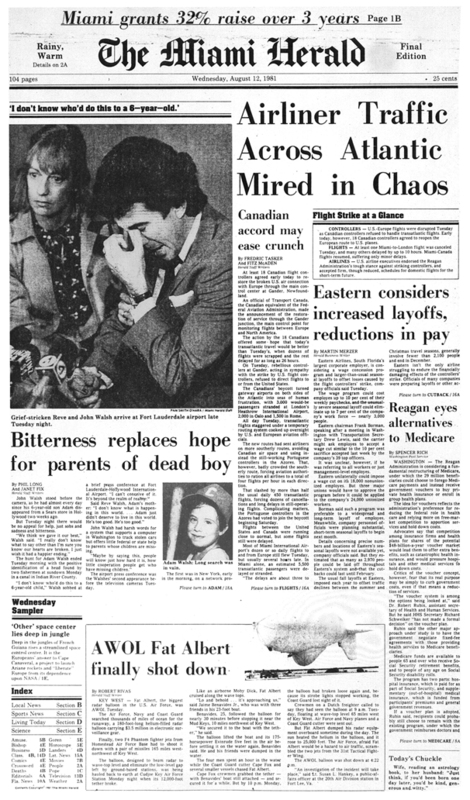 8/12/1981: Pam Smith O'Hara/Miami Herald: Reve and Adam Walsh, parents of Adam Walsh, meet the press after returning to Fort Lauderdale-Hollywood International Airport from New York, where they appeared on "Good Morning America". John Walsh had been preparing to plead on on national TV for the return of his missing son when he learned that fishermen had found the severed head of a child floating in a canal outside Vero Beach, Florida. After he left the set he learned the remains had been identified as Adam's. Tropic Magazine Cover, January 24, 1982. 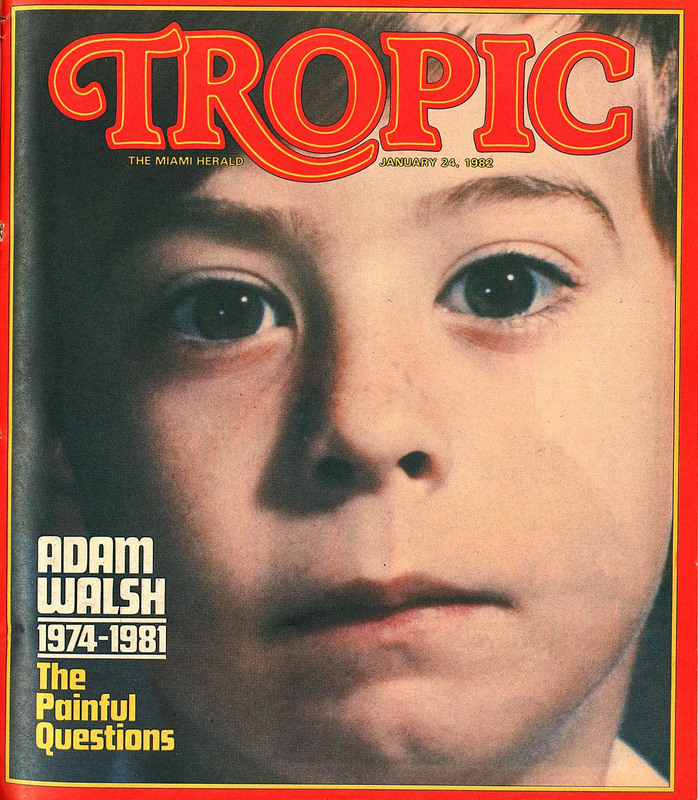 "Adam Walsh 1974-1981: The Painful questions"